Providing you the best range of compression plate, limited contact compression plates and 3.5 mm small compression plates with effective & timely delivery. 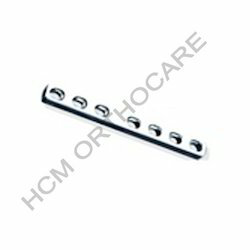 We have gained immense domain knowledge to present a wide spectrum of Reconstruction Compression Plates such as Compression Plate that is extensively used in orthopedic implant surgeries involving reconstruction as well as compression by renowned orthopedics. These are designed by strictly adhering to global standards and manufactured from the finest grades of metal alloys. We offer wide range of specifications of these plates to match requirements of our valued clients and maintain rigid quality norms that are in accordance with laid down standards of the domain. Our prestigious clients can avail these at affordable prices. 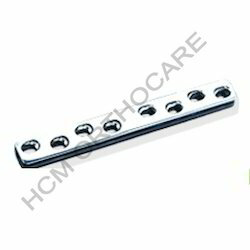 We are regarded as well-known manufacturers, suppliers, and exporters of a broad assortment of premium quality Reconstruction Compression Plates including Limited Contact Compression Plates that is used in orthopedic procedures involving reconstruction and compression. These are made by using the finest grades of metal alloys and are subjected to rigid quality checks that are in accordance with well defined international norms. We use sophisticated technologies to manufacture these plates in our state of the art manufacturing facilities. Our range is appreciated by leading Doctors and Orthopedics for unmatched performance. We offer these at very reasonable prices to our patrons. We are pleased to present our valued clients a wide range of Reconstruction Compression Plates of unmatched quality such as 3.5 mm Small Compression Plates that is commonly used during orthopedic fixation surgeries involving compression. These are manufactured by rigidly flowing preset industry standards and manufactured by using the highest grades of metal alloys that are procured from reputable vendors of the domain. Our range of implants is widely used in leading hospitals by opinion leaders of the medical field and appreciated for satisfactory performance. We follow stringent norms of quality and hygiene in accordance with international standards while manufacturing these implants. 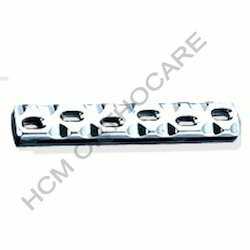 Looking for Reconstruction Compression Plate ?